It's about a boy who escapes the real world and goes to this fantasy world where he befriends these big furry trolls, the trolls are animated, but the boy is played by an actor. 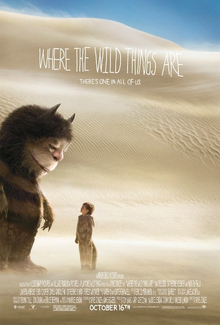 Where the Wild Things Are (2009)? Found by memory. Never seen it but I remembered the big furry things as well (and the funny pun in the translated title in my mother tongue, French). In the movie, a boy name Max runs away, traversing a pond that becomes an ocean to find an island with Wild Things, which do look like trolls.